Categorized as: Stories on March 7, 2011. Partner: Freedom from Hunger’s Saving for Change program through local West African NGO TONUS. Growing up in the very same village where she has always lived, Assa Fofana saw her father die young, but the family managed to muddle along. “Even the tiniest amount of money went a long way,” she recalls. As a child, Assa “sold a lot of boiled yams at the market.” Her mother bought milk and meat from a train that passed right through their village. Unfortunately, the train no longer runs through Dio Garé. “I had better foods than my children do now,” reflects Assa. These days, the village has fewer food choices, and at higher prices. However, life in the past wasn’t exactly idyllic. Assa’s mother had no access whatsoever to education, and thus had “absolutely no influence” in decisions at home or in the community. 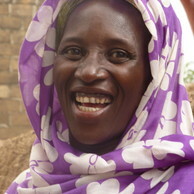 Assa became the third wife of a much older man, who landed in jail for stealing money. She struggled to get away from him, but they’d been formally married in the mayor’s office and the man refused to approve a divorce. “That was a really difficult time,” Assa says. Eventually, with the help of her older sister and brother, Assa prevailed. She divorced and remarried. Now 48 and the mother of four children, Assa has ambitions far beyond her current work selling produce (tomatoes, cabbage, onions, and zaban, a local fruit). She perches on a small carved-wood stool behind the woven rug that displays her wares and talks above the clamor of market transactions all around her. She waves her hands as she talks—not about what she already has accomplished, but what she plans to do next. “Now, I am doing things to improve myself,” she says. For example, Assa attends night school for adults. “I can achieve a good life,” she asserts, “because I am learning how to read and write!” Having heard about the savings group from her mother and sister, who were already members, she joined a savings circle with Freedom from Hunger’s local partner TONUS. Initially, Assa had to borrow from the group just to purchase basic food and medicine for her family. Despite their best efforts to sleep under bednets, the entire family still suffers from malaria each rainy season, and her husband has a chronic eye infection. Later, Assa took out two specialized loans: a health loan for malaria medication, and an emergency loan to finance her nephew’s wedding. She paid both back in full. And now, determined that her one son and three daughters receive a “proper” education, when the circle comes round to her turn for a loan, Assa spends money on textbooks and school fees. “My children study very hard,” she says, “so I am confident that that they will also achieve a good life someday.” She reports that her eldest already has nearly completed his program to become a police officer. Having participated in malaria and literacy education, Assa aspires to more. “Training would help us find work and money. We want to make shea butter and soap,” she notes. The 29 members of her group voted on a social goal to raise funds for business training, so they can find more work and increase their income. Also, Assa wishes for agricultural education and supplies, so villagers can do more than just plant seeds and watch them wither. “You must also buy pesticides” and fertilizer, she explains, “to help your crops; otherwise, nothing will grow.” According to Assa, simple changes like this would prevent the seasonal hunger that still impacts rural Mali. During the three years Assa has participated in the savings group, her loans have shrunk from 50,000cfa (U.S. $106)to 20,000cfa (U.S. $42), and her savings have grown enough (about $20 just three months into the current cycle) that she plans to buy and raise livestock. That will add some variety to both her family’s diet and the village market. Being in the savings group is the one thing Assa does not wish to change: She plans to remain a member forever.